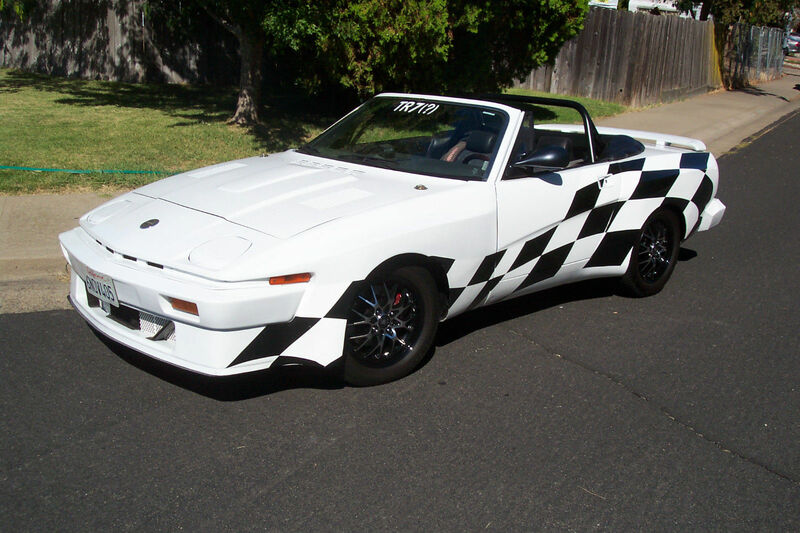 Daily Turismo: Loony Labor Day: 1981 Trumph TR7? Loony Labor Day: 1981 Trumph TR7? The Triumph TR7 was a British built classic that is easily identified by its signature wedge shape, but when someone adds custom black/white checkers and a big TR7(?) on the windscreen...it makes you stop and wonder. Find this 1981 Trumph TR7? here on eBay bidding for $3,050 reserve-not-met with a few hours to go, located in Roseville, CA. Up for sale is my ONE OF A KIND TR7 (?). Why the (?) you ask? As you can see from the pictures, while she started out as an anemic 1981 TR7, she has morphed into what she is today. She is now fitted with a 231 cid Buick V-6 engine coupled to a Camaro T-5 5 speed and delivers the power to a Mustang GT rearend with 2.73 gearing and limited slip. The brakes are Wilwood aluminum 4 piston calipers on the front and 11' vented and drilled rotors. I actually think the looks of this could be saved. Can you imagine a dark green paint job, Talbot mirrors, and wide black steel wheels? Questions For The DT Radio Show? Coffee Brake: What Is Too Weird?